Each year the Maryland Horse Council honors a person who has had a long, productive career in the equine industry. The award has recognized teachers, trainers, breeders, riders, farriers, veterinarians, saddlery experts, and more. The vital link, however, is the honoree’s distinctive ability to inspire young people to join their love of horses with making a living. The combination of inspiration and career describes perfectly the life of this year’s winner, Robert Eldredge of Monkton, Maryland. Born in 1929 to dedicated Salvation Army officers, Bob Eldredge came to Maryland in the depths of the Great Depression when his father, Brigadier Douglas G. Eldredge, was given charge of Misty Mount, a Salvation Army camp for children in the Catoctin Mountains near Thurmont. With World War II looming, the United States government chose the site for a presidential retreat, now called Camp David. As a result the Eldredge family, including Bob and his two brothers and two sisters, was transferred to the Salvation Army base in Baltimore. Wanting to continue his camp work, Brigadier Eldredge prevailed upon the Gunpowder Youth Camps (supported by the Towson American Legion, the Towson Kiwanis, the Cockeysville Optimist, and the Towson Rotary) to lease a wooded portion of their 200 acres bordering the Gunpowder Falls near Monkton to the Salvation Army for their camp. In 1942 Camp Puh’tok (meaning “in the pines”) for Boys opened; Bob Eldredge was 12 years old. Another element that set Camp Puh’tok apart in that era was its multiplicity. From the beginning, the residential camp stressed diversity among the campers, ages 5-16; Puh’tok in 1942 was practically the only camp where African-American boys could participate alongside their white contemporaries. In addition, the outdoors program was augmented with an emphasis on Native American culture. “It was a natural extension to the natural world,” Bob explains “In the 1950s Chief Sunrise (Rubin Jacobs), the great-grandson of the Sioux chief Sitting Bull, took an interest in our programs, and we integrated the Native American ideals into what we did at the camp. We used the culture of the Indian as a foundation; we just gave the Indians a fair shot. The stated mission of Camp Puh’tok was and still is to emphasize leadership, teamwork, spirituality, appreciation of nature, discovering our American heritage, and the importance of giving back to the community. These same qualities, not to mention generosity, are the essence of Bob Eldredge the man as well. In his formative years, Bob worked at the camp in the summers and attended Baltimore City College during the school terms. At graduation, Bob’s sights were set on college, but the United States government had something else in mind. The Korean War was on and Bob joined the Navy, assigned to the Roosevelt, which at that time, was the biggest aircraft carrier in the U.S. fleet. When his hitch and the war were over, Bob went to Springfield College in Massachusetts, and then returned to Maryland and the camp job he also loved. There he started yet another program. Bob is considered by many to be a fantastic storyteller. Bob’s daughter Kim Wight recounts the story that Bob’s initial fascination with horses began at eight years old in 1937 when he and his brother watched Seabiscuit’s famous race against War Admiral through the fence at Pimlico, not far from where they lived at the time. Lou Kousouris, today the vice-president of the Baltimore Orioles, is boundless in his enthusiasm for Camp Puh’tok and what he gained from his experiences there. Yet, he admits that he didn’t start out feeling that way. Horses made the difference. “I had ridden since I was five years old, and I used to go to the track with my uncle, who was a jockey,” Kousouris recalls. “But when I got to the camp, I didn’t like it. All I wanted to do was ride, but they said I was too young. Finally, Bob figured a way to make this work so that I could be part of Top Bar Ranch. Today, as a matter of fact, Lou, a dedicated horseman himself, is chairman of the Camp Puh’tok board that purchased the camp property from the Salvation Army when that organization wanted to go in a direction more in keeping with their other camps that didn’t include horses. A volunteer board oversees the camp as a nonprofit organization. This too came as a result of Bob’s dedication to the ideals that had existed since the camp’s founding. Lou is also quick to point out that he is hardly the only person who has benefited from Bob’s creativity and quiet force of personality. He cites former campers Don Hutchinson and Ted Venetoulis (both became Baltimore County Executives), Nicky Venetoulis (aka Nick Venet, a producer for Capitol Records), Bob Pitman (head of the ceramics department at Towson University), and Charlie Nemphos (a certified public accountant), plus six West Point and Naval Academy graduates, including Lou’s own son. During the summer of 1958 when he took up once again his job at Camp Puh’tok, Bob fell off ahorse and broke his pelvis. 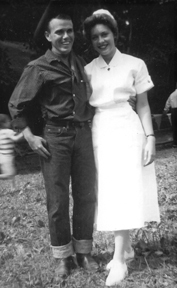 He contends that he wasn’t really all that hurt, but his recovery was extended because of the camp nurse, Peggy Schoepflin. “She was very pretty. I was happy,” Bob quips, with a smile. Peggy and Bob were married four months later. He took a full-time job with one of the Boys Clubs organizations in Delaware, where their daughter Kim was born. Subsequently, the couple moved to another club in Mount Kisco, New York, and welcomed a second daughter, Wendy, into the family. They returned to Maryland in the early 1960s when Bob took charge of the Middle River Boys Clubs. Bob took many classes in design and fine art at the Maryland Institute College of Art. In 1964 that blend of creativity and interest in horses led to another career. Bob became the managing editor and art director of The Maryland Horse, responsible for layout and design of the magazine. Nancy Boyce, an artist in her own right who wrote for the magazine for many years and created a monthly page of very popular cartoons on the equine subjects of the day, was a contributor to the magazine at the time Bob was there. “I learned so much from Bob,” Nancy says. “With his wonderful eye for design, he made The Maryland Horse what it was in those days: a prize-winning publication. “What many people don’t realize is that Bob is a fine artist. Working in watercolor, not an easy medium, he is very talented. 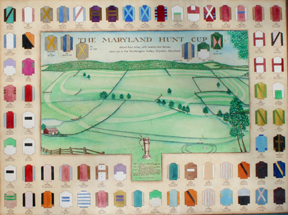 He created beautiful maps of the Maryland fox hunting country and maps of the Maryland Hunt Cup course that are treasured today. He is also the creator of the illustrations in Peter Winants’s book Jay Trump,” she adds. Ross Peddicord, who also wrote for The Maryland Horse as well as reporting horse racing for The Baltimore Sun and is now the co-publisher of Maryland Life magazine, agrees with Nancy’s assessment. Barrie Reightler, currently director of publications at the magazine, started her career under Bob’s tutelage. “Bob’s concept was to give the magazine a National Geographic feel,” Barrie remembers. “This was the heyday of The Maryland Horse, with the emphasis on the great photographs of Winants, Ball, Jackson, and Ewing. They were cutting edge. Bob was very creative and the layouts were extensive and elaborate. 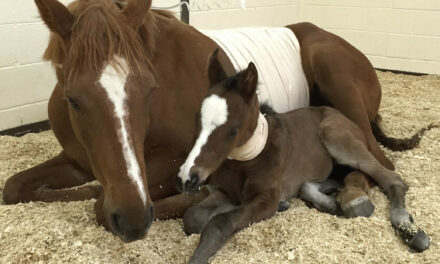 The evolution of The Maryland Horse, now called Mid-Atlantic Thoroughbred. Between 1979 and 1986, The Maryland Horse won eleven first-place awards from the American Horse Publications organization, including five for general excellence. During that time, Bob was offered a position with the prestigious national thoroughbred racing magazine, Blood-Horse, but he turned it down. He didn’t want to move his family to Kentucky. 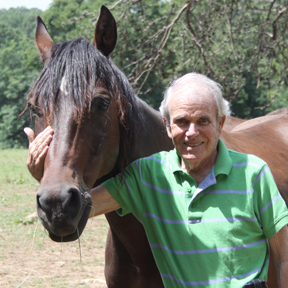 Throughout his career of twenty-two years at The Maryland Horse, Bob continued to be involved with the work of Camp Puh’tok. Thus, it was a likely occurrence that he return there as executive director when he retired from the magazine in 1986. About that time, Kim Eldredge Wight was in charge of the horse program at the camp. She and her sister Wendy were never “real campers,” because the program was limited to boys. However, the family lived at the facility during the summers, and Kim and Wendy were intimately aware of all the aspects of the camp life. Peggy, Bob’s late wife, was similarly engaged in the work. Therefore, it seemed almost predictable that Peggy would tell Bob one day in no uncertain terms that the camp “could no longer have just boys,” as Bob remembers. Alexi Kousouris (Lou Kousouris’s daughter) made the trial run in 1984 when she was six years old. In 1988 she came back as a full-fledged camper with other girls. 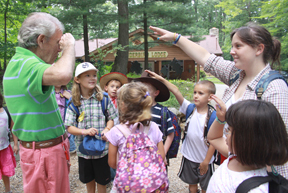 Since Bob’s retirement in 2007, Alexi has been the camp director. “It is interesting to think that with all the emphasis on diversity, the camp was limited to boys,” Alexi muses. “Times have changed and again that change was realized because of Bob. The horses, according to Alexi, are part and parcel of this complete experience. She said that many of the children who come to the camp have never even seen a live horse before. The interaction takes them from being completely afraid to being comfortable with a large animal. Alexi goes on to explain, “Bob’s creativity, his imagination, gives us a uniqueness. He has so many ideas, not only of how our programs can be educational, but how they can be fun as well. In 2002 Bob added a completely different accomplishment to his long list: land preservationist. The 67-acre parcel of the camp was placed in a permanent conservation easement through the Gunpowder Valley Conservancy, a local nonprofit land preservation organization. “It was Bob’s initiative that encouraged the Salvation Army to put this property into an easement,” states Charlie Conklin, president of the GVC. “Bob also promoted funding for the easement from the Abell Foundation on the basis that the camp provides a place for children to experience nature and the traditions of the Native Americans. 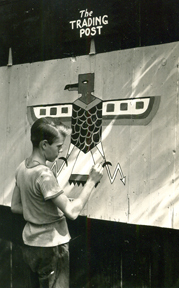 Artwork by Bob, pictured here in the 1940s, is still found all around the camp. Today, this camp that his father founded and that Bob Eldredge has devoted his life to has grown. There is a day camp as well as the residential camp; boys and girls come to camp together; the horses are far better trained than the first ones that Bob found wherever he could; and some 5,000 Baltimore County public school students participate in environmental programs at the camp during the school year, such as studying our Native American heritage, making maple syrup from the camp trees, and identifying wild animals and plants on the site. Bob, in his quiet way, however, sees it differently, or at least in the way he persistently views any suggestion that he deserves the Maryland Horseman of the Year award.